Playing sports provides important benefits for young and old alike, ranging from improvement in fitness and health to development of team spirit and feelings of accomplishment. Find a sport that you love and you'll stick with it while at the same time learning some essential life lessons and reaping positive rewards. Playing sports, particularly those that involve a lot of activity, such as soccer, basketball, tennis and racquetball, can help you manage your weight, while also giving your muscles and cardiovascular system a good workout. Participating on a regular basis helps you burn calories. For example, a 155-pound person who plays basketball for an hour burns around 596 calories. 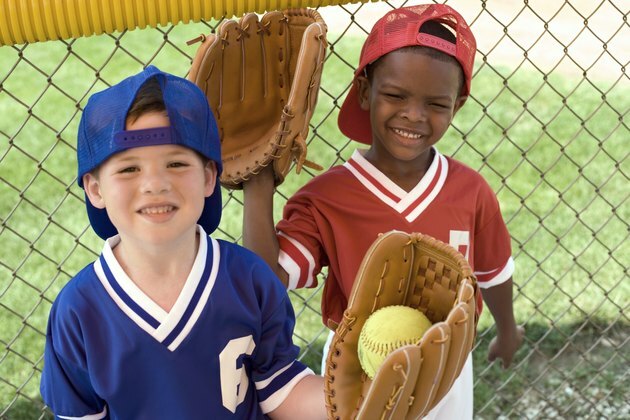 Starting kids in a sport that they can play throughout their lives can get young people used to exercising on a regular basis, which will help them stay in shape as they get older. Getting involved in a sport provides opportunities for individuals to see the results of their efforts. If you practice hard at your sport and see success, it builds self-esteem. If you defeat a challenging opponent, you're bound to feel that you've accomplished something worthwhile. Mastering a skill, such as a consistent serve in tennis, also boosts self-confidence. Sports can provide a unique opportunity for participants to learn and appreciate the importance of teamwork. That's assuming you're playing a team sport, rather than an individual one, such as tennis or golf. If you're on a team, you learn what it means to do your share of the work and reap your share of the benefits. The idea is that everyone on a team learns to rely on everyone else. Young people who excel in sports but have limited financial means find that sports can improve their odds of attending the college of their choice. While many athletic scholarships do not provide all the expenses for attending college, some can help considerably. If you have a knack for baseball, football, basketball or even the less common sports such as lacrosse or crew, your abilities may help lead you to an opportunity to play and learn in college. Rutgers Youth Sports Research Council: The Role of Winning in Youth Sports; By David A. Feigley, Ph.D.